Today, October 19, 2017, it has been one-hundred years since the tragic death of silent film child actress Pauline Flood, also-known-as “Baby Sunshine.” Little Pauline was almost two years old when, while playing on the Universal Studios lot, she crawled in front of a moving truck. She died shortly afterward at Hollywood Receiving Hospital. 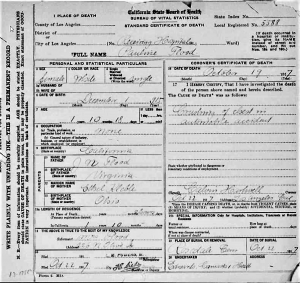 Pauline, born on December 1, 1915, was the daughter of James and Ethel (Kolble) Flood. As “Baby Sunshine,” she apparently appeared in at least nine films, but Imdb has no record of her work. Variety said at the time that she was known as the “tiniest star in films.” Another source cited her tragic death as “…the youngest celebrity ever to have been killed by a car.” Regrettably, there are no known photographs of her. Pauline is buried at Rosedale in Section 7 (Lot 1, Grave 2N-2W) in a section reserved for children. Her grave is reported to be unmarked. Within three months, Pauline’s father James, died from diabetes on January 9, 1918, and was buried at Rosedale. He was 49. 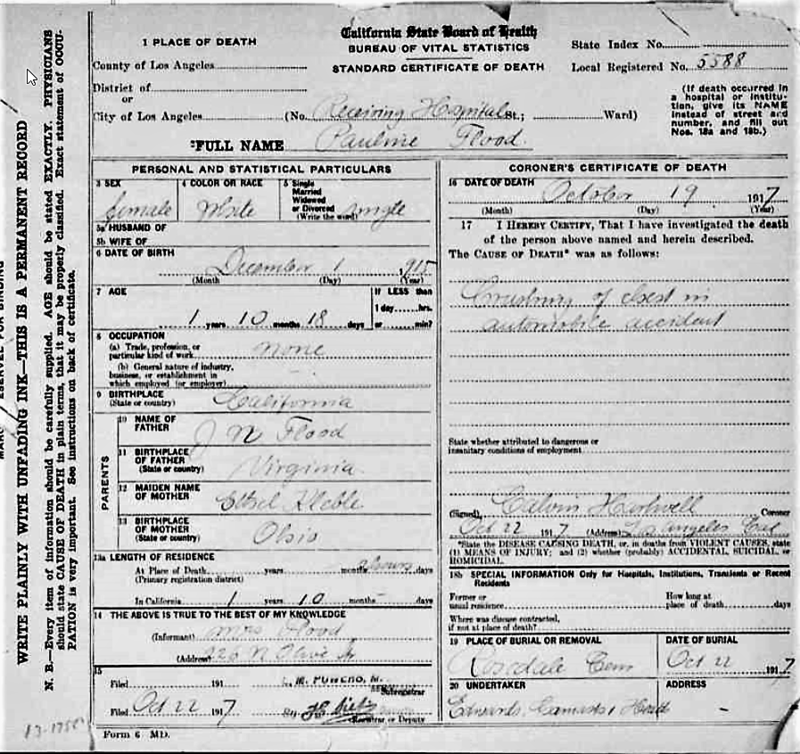 Pauline’s mother, Ethel, who was 28 at the time, remarried and died from tuberculosis on October 18, 1925–eight years (shy one day) after Pauline’s death. Her new husband, John Ashbridge, buried her at Odd Fellow’s Cemetery. If anyone has information to share about Pauline Flood’s life and films, please post your comments here. This entry was posted on Thursday, October 19th, 2017 at 1:31 am and is filed under Book/Film News, Celebrity Deaths and Funerals. You can follow any responses to this entry through the RSS 2.0 feed. You can skip to the end and leave a response. Pinging is currently not allowed.